Both hope they have the winning hand as the battle to pass, or defeat, Michigan’s Proposal 1 moves into its final weeks. How Proposal 1 became that piece of legislation is a case study in (depending on your point of view) either how politics is supposed to play out in a bipartisan spirit of compromise, or further proof that Lansing can’t do anything right. Proposal 1, the legislature’s proposed solution to Michigan’s crisis of road-maintenance funding, is described by even its proponents as complex and by its detractors as a mess. Comprised of 10 bills and a constitutional amendment, it would raise $2.1 billion the first year, $1.3 for roads and debt relief on past road construction, plus $382 million for education and municipal revenue sharing, as well as more for mass transit, the state’s general fund and an expanded Earned Income Tax Credit. It’s these extras that have enraged detractors and are defended by its proponents. To legislators involved in the December deal-making that gave birth to Proposal 1, adding extra funding for schools and local governments, while also increasing the Earned Income Tax Credit to soften the blow to lower-income families, was simply what it took for Republican leaders in Lansing to get the support they needed from Democrats. And, they add, it attempts to restore funding that was cut, sometimes brutally, after the Great Recession. The problem, Lane and Democrats contend, is that the other party is so wedded to an anti-tax stance that it lacked the fortitude to vote directly to raise taxes, even when residents state they’re willing to pay more for improved roads. So the tax ended up being punted to voters to decide. To Republicans, bipartisan accord on this package could only come with the crafting of a proposal that would appeal to lawmakers of both parties. And observing the mashup that is Proposal 1 are the state’s voters, who in a chorus of website comments and social-media postings express a range of reactions, but appear to be anything but sold on the proposal, mostly faulting the legislature for the plan’s complexity and perceived excesses. “That’s being lazy,” Jase Bolger, the former Republican House Speaker who was an architect of the plan, said of the criticism, adding that many newspaper columnists and editorial boards have drawn the same conclusion. It isn’t political cowardice that pushed Proposal 1 onto the ballot, he said, but policy – the sales tax can’t be raised without a vote of the people. Legislative observers will recall that late last year during the lame-duck session when the roads funding debate came to a head, Bolger presented a plan, roundly criticized by Democrats as both inadequate and injurious to education funding. It proposed to gradually raise the gas tax while reducing the sales tax and relying on annual growth to protect schools, which Grand Rapids Democrat Brandon Dillon dismissed it as “faith-based economics.” After the six-year phase-in period, opponents said, K-12 education could lose as much as $1 billion a year. The Republican-led Senate had its own plan: a rising fuel tax, that would have roughly doubled the amount collected on gasoline over the course of several years. Neither plan had the support of the governor, who wanted a higher fuel tax imposed at a time of historically low gasoline prices in order to quickly raise the $1.2 billion he said was needed to repair Michigan’s awful roads. With no consensus, and Democrats cool on both plans, the far-more-complex machinery of Proposal 1 was hammered out in the final hours of the session. Bolger, now out of office, is supporting it. “The bottom line is, this is a difficult problem with no easy solutions,” he said. Difficult problems rarely have simple solutions, and the selling of Proposal 1 has leaned mostly on one simple idea: Safety. Safe Roads Yes is the coalition in support, and as of February 10 its major contributors were road-building interests, according to Rich Robinson of the Michigan Campaign Finance Network. Advertising so far has been limited to mailers and a few videos, from proponents and opponents. Robert Kolt plans to vote for the proposal, but after a lifetime in advertising, much of it political, has no envy for his colleagues who have to sell it. “My experience over decades is, with a ballot proposal, you start at 60/40 no, unless they get a persuadable case for change,” said Kolt, who teaches advertising and public relations at Michigan State University. He contends that “most voters have made up their minds,” and the challenge will be to reach undecided voters with just the right pitch at just the right time. Social media interaction on websites like this one is going to make it hard for the traditional tv ads to have an influence on building support for the proposal. just my opinion. Regressive taxes hurt those who can least afford it. The claim that the increase in Earned Income Tax credit will offset the pain is just pure cynical lies. For one thing, retired folks have no earned income, so are not eligible for the credit, but will be hit hard by the increased sales tax. For another, this doesn't really GIVE anything to the poor; it merely returns what the governor and legislators took away in Snyder's first budget. The credit was cut from 20% to 6% to fund the big tax break for businesses. Furthermore, if they could cut the credit once, who's to say they won't do it again, maybe next year after the tax increase goes through? As a retiree with about $12,000 income per year, I wouldn't mind if taxes were raised so that roads got fixed, schools got more, and my local government had more money for services, police and fire. But the Republicons have had five years to fix the roads and have lied to their constituents that the state had too much money. If that were true, why didn't they fix the roads? It was their responsibility, and instead they gave huge tax breaks to the rich and corporations. They wouldn't raise taxes because it would be proof they were lying. I don't trust them. They can cut the EITC, the schools and the municipalities the day after this thing passes. Vote NO! Not because we don't need more taxes to fix the roads, but because your Republican government can't be trusted. And the Dems are as gullible and hapless as ever. Much of the negativity toward ballot measures can be lid at the GOP doorstep particularly Gov. Rick. They have consistently decried ballot measures put up by the people with "vote against them all" Well, the voters intend to continue doing just that. I however have seen the merit, even of this complicated package and will vote YES. The House measure simply stole more money from schools and local governments to made up by the GOP's disproved "rising economy" theory. The package seems to meet the needs of all those affected and does impose a guarantee on contractors which has been needed for some time. I do have some trepidation in having to trust our Legislators to develop policies that they have promised, especially with more money involved. I would more likely trust the Dems to do what they say with my tax money than the Republicans who always promise lower taxes, less fraud and abuse and never deliver because they "figured it wrong" or "the economy didn't meet expectations" or "we didn't take that into account." At least the Republicans want to fix the roads - the Democrats had to have free give-aways added in order for them to support the proposal. snyner just wants to give tax breaks to the rich and huge raises to his buddies. Some of that money could have gone to roads. The republicans can NOT be trusted. I am ready to vote YES! Would you also be willing to vote for a graduated income tax since it appears you have more money than most? For someone who makes numerous big purchase almost every year the 7% sales tax could be significant. The State of Mi. said that the first 2500$ of a major purchase for a car would not have Sales Tax imposed on it. BIG DEAL . That will save you a huge amount of $150. On a $30000 car you will still pay $1925 Tax at the 7%. Some states charge tax on the difference between the new car and the trade in. Not MICH. Make each voter issue a single issue to stand on their own merit. No bundling. R.L. Could the Bridge do two things to help clarify things? 1) Print the entire language of the Proposasl as we'll see it on the May ballot? 2) Give us a numerical analysis showing dollar amounts. FOR THE CURRENT SITUATION How much the 6% sales tax currently collects and where does it go? Schools? universities? general fund? Any to roads? Give us some $ totals. Is the 6% currently collected on gasoline tax distributed in the same way? How much is that total? How much is collected from registration fees and where does that go? How much from current per gallon State fuel tax and does that all go to roads? How much do we collect and how much do we get back from the Feds tax per gallon and does it all go to roads? How much do localities get from revenue sharing now? UNDER PROPOSAL 1 Where does the extra 1% sales tax go? Same as the original 6%? How much to schools, universities, roads revenue sharing? What are the totals for each under the new 7% rate? How will the new wholesale fuel tax be distributed? All to roads? What's the distribution to state trunklines, counties and townships and municipalities? Any change in the current distribution formula? How much will be collected based on a price per gallon that can be compared with the price of gas today so that the average voter can judge the proposed wholesale tax with the current situation? (Most analyses I have seen give a range of proposed rates that vary with the wholesale price. Duh... of course. But that doesn't let us compare what's being collected today with what will be collected under Proposal 1. Surely it's possible to research what wholesale price today equates to a price at the pump and give us a dollar total for the proposed wholesale tax compared today's retail tax.) What about registration fees? How much more will roads get compared to the current amount from registration fees? Show us the totals that schools and municipalities get now amd how much they'll get under Proposal 1. Are there any guarantees that schools and revenue sharing entities will continue to get the amounts they presently get? And that the newly promised additional school funding and revenue sharing will truely be additions to their furnding? What's proposed for the additional tax reciepts that will go to the State's general fund? IN SHORT we need some numbers that are comparable. I will be voting no on this Prop and I will be urging everyone I know to vote no also. My family can not afford the increase in the sales tax and the increase in the other fees and taxes in Prop 1. 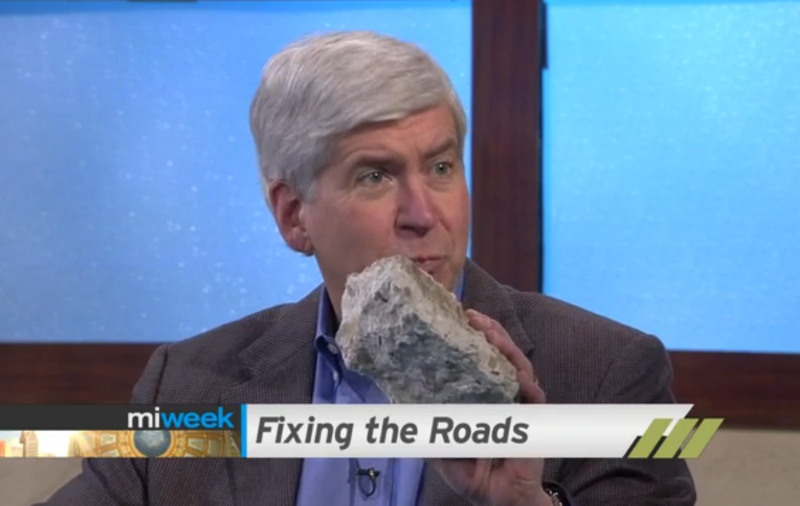 Snyder can go to his big business buddies and to Devos and the Mackinac Center loons to get the money he needs to fix the roads. And one last thing. I don't believe anything Snyder and his cabal of nut jobs in Lansing have to say about anything. Their goal from the beginning has been to cut taxes for the 1% while increasing fees and taxes on the middle class and working poor. This is what he has done now for 5 years and I'll be damned if I'll say yes to anymore of it. All i want to know is why cant they make roads right in the first place? Where did all the money go that you have already collected from us? Seems more like job security to me. Make crappy roads and do nothing about trucks weight limits. I will be voting no on any increases in sales tax. You get enough already. Go find it somewhere else. I'm sure if all the rich could eat Ramon noodles for a day we could fix allot of stuff with the leftover money they would have spent on there steak and/or $$$ restaurant bills. I will be voting "no". Until the truck weight limits are brought in line with the rest of the country, the money spent on roads is useless. I am tired of wasting my money on crappy road repairs. Make the companies responsible for proper road construction and liable for repairs under warranty. Then, I would vote "yes". Hey, what happened to all those legislators who were always bragging about how they "made the tough decisions"? Did they all get term-limited? From the commenters who are expressing that they want a simple bill, I am beginning to realize that the citizens of Michigan do not understand how bills are piece-milled together. We the People have to become more engaged. The idea of an efficient legislature is a pipe dream. This proposal IS simple from a legislative point of view. The Citizens Research Council of Michigan (http://crcmich.org/) has a good report regarding the proposal. If you prefer to pay upwards of 50 cents per gallon of gas just in tax by voting no (sending more money to the Federal Government than under proposal 1) be my guest. A tax is going to go up and you and I are going to pay it. Voting no means that the issue will return to our legislators who will make more and different deals leaving everyone with an even more unreasonable tax and even further behind when it comes to road and bridge replacement. No one wants to pay more tax, however, a penny more in sales tax will be money going directly to Michigan programs. Voting yes to add funding to rebuild our roads and bridges (infrastructure) has absolute positive effect on our economy. Proposal 1 dedicates more than $1.3 billion to the repayment of bonds for work done on roads in the 1990's. The majority of the funds raised goes to the payment of debt for the first 2 years. And if the Legislature can't or won't solve this problem by handing it off to voters, why not just have voters deal with all issues, and eliminate the Legislature? Proposal 1 is still a ‘pig in a poke’ no matter how they wrap it. You have no idea what you will get with the spending, will the roads actually be safer next year, will they last an extra 10 years, will these politicians even care after May. I know my State Rep. never comes back to town and talks about what the actual results of Lansing's spending is. I have learned politicians (pre-term limits) enjoy spending other people’s money on ‘pork’ and where they seem to spend it most is on roads. When my money is spent on 'pork' I expect in on my dinner plate so I get something from it. That headline would be far more apropos above a story telling how the Edelson team ended up leaving the campaign and getting replaced with Martin Waymire.et. al. as the chief wool-pullers. He looks pretty "nerdy" holding that piece of concrete. LOL. "Hey, wanna see what anybody who thinks the voters will pass Proposal 1 is dumber than?" When I moved to Elkhart County in the early l970's, Michigan roads were better than Indiana's. Two decades latter Indiana had better roads.Governor John Engler got a fuel tax increase in the l990's. This allowed to improve its roads considerably. However that was almost two decades ago. this proposal deserves a YES vote. If you vote NO, you are voting for more damage to your vehicles.